BigDryFly.com: That could buy a lot of fly rods! 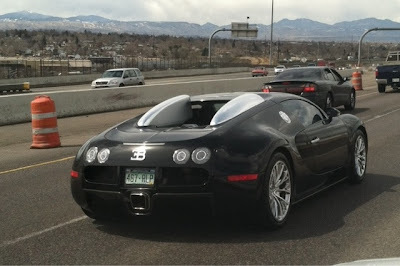 Yesterday I was driving through Denver when I noticed a black car about to pass me in bumper to bumper traffic. Luckily we were traveling at about 5 mph, so I could fully appreciate driving next to a car with a base price of around $1.7 to $2.2 million. 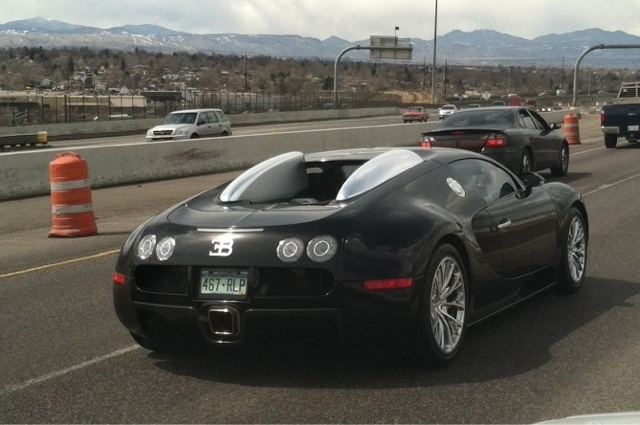 It is the fastest production car in the world, the 253mph Bugatti Veyron. Although I appreciate a fine vehicle, imagine how much flyfishing gear that would buy! It was difficult to see the driver clearly, but I'm pretty sure the driver was Howard at the Windknots and Tangled Lines blog. Glad to see your blog is doing so well Howard! You know last I heard, Howard, was about to take a flying leap into something that would impress us all. That kind of action for him would probably be more than his ol' ticker could handle. He always did like pretty girls! Yeah, I've always been lucky (or unlucky depending on your point of view) with the ladies. You see guys, this is what you can afford when you fish all that old crappy fiberglass and $50 reels. I did not see a fly fishing rod anywhere on that car so I will have to stay with the pickup! So was BDF going to or coming from a fishing spot?